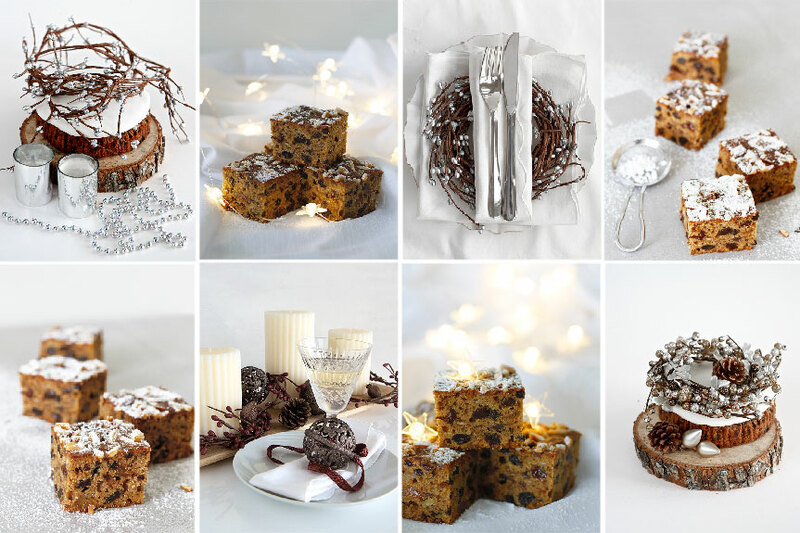 Fruity, light and and spicy – this year’s delicious light Christmas Cake. 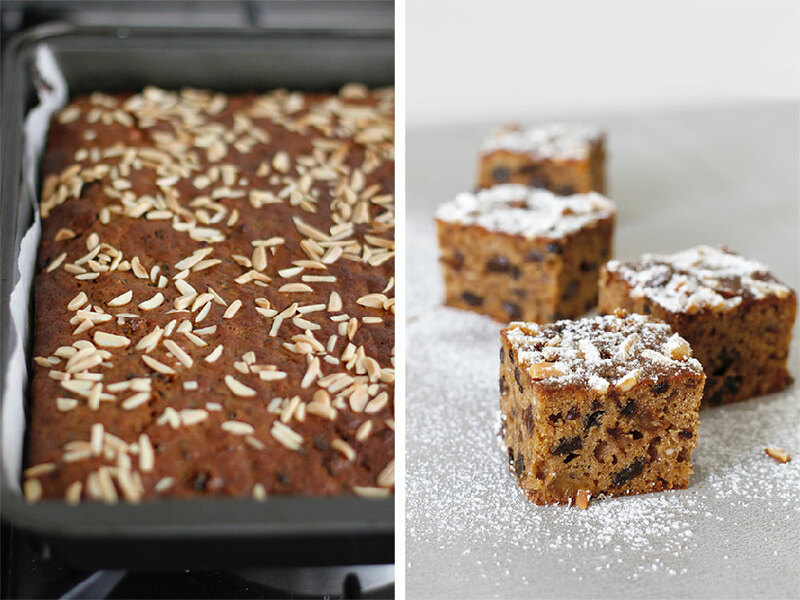 Made in a tray, it is perfect for a “quick night before, forgot to make a Christmas Cake”, kind of cake. 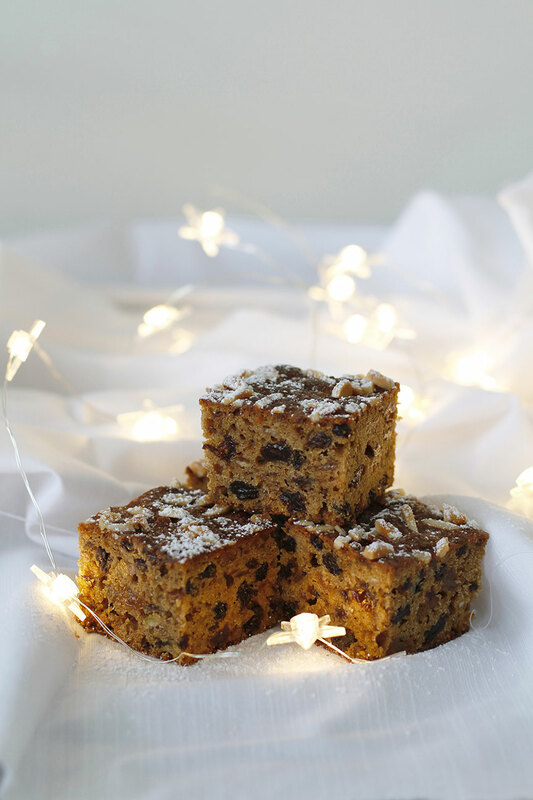 Heavy fruit mince Christmas Cakes are a thing of the past, and this one has a small amount of fruit mince with some candied ginger, citrus peel and banana to lighten it. 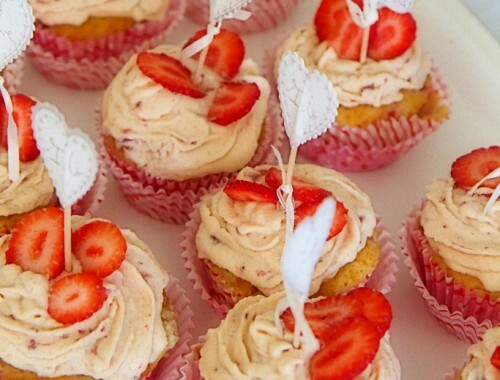 Its the type of cake you could make all year around without hesitation. 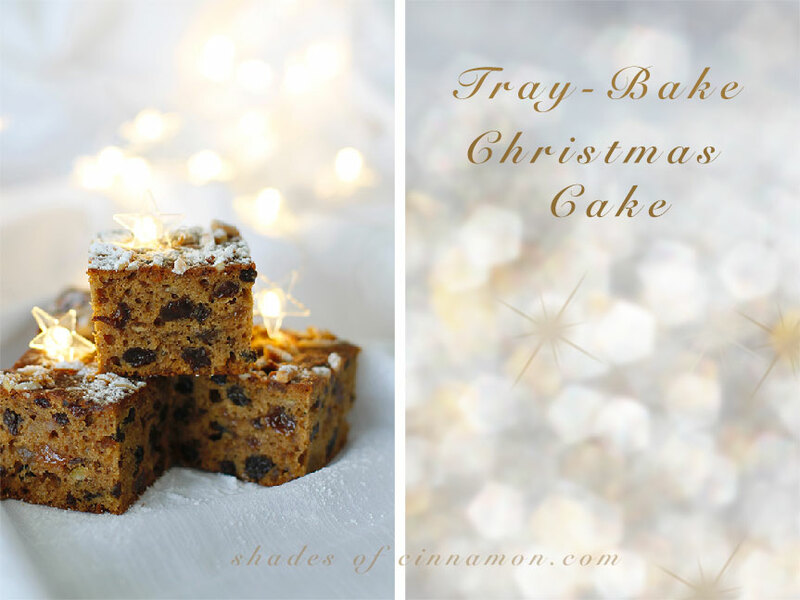 This cake can be eaten as soon as it has cooled and also stays fresh for up to two weeks in an airtight container, which makes it so versatile over the festive season. Preheat the oven to 160ºC . Grease and line with baking paper a 32x22cm rectangular baking tray/oven tray. 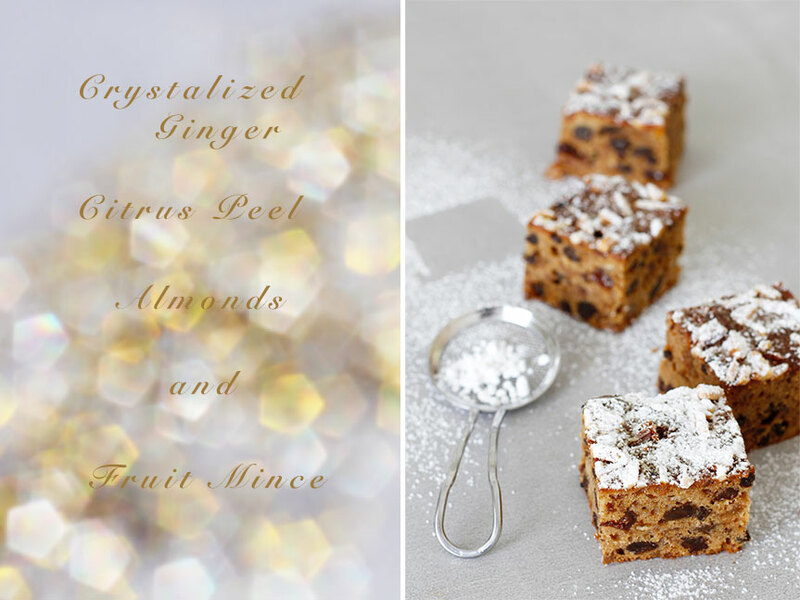 In a medium saucepan combine ginger, fruit mince, butter, sugar, citrus peel, lemon juice and the brandy. Stir over medium heat until the butter has melted and sugar dissolved. Bring to the boil and remove from the heat. Stir in the baking soda. This will make the mixture bubble up. Transfer to a large bowl to cool . Stir mashed banana and eggs into the fruit mixture. Sift the dry ingredients into the mixture and stir until well combined. Spread the mixture into the greased pan and sprinkle with slivered almonds. Bake for about 55 minutes. Test that it is cooked through and then allow to cool in the pan. 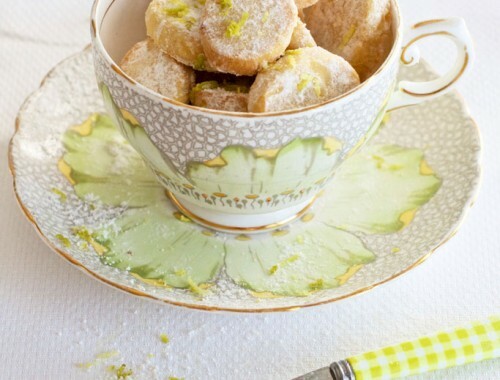 Cut into squares and serve dusted with icing sugar. 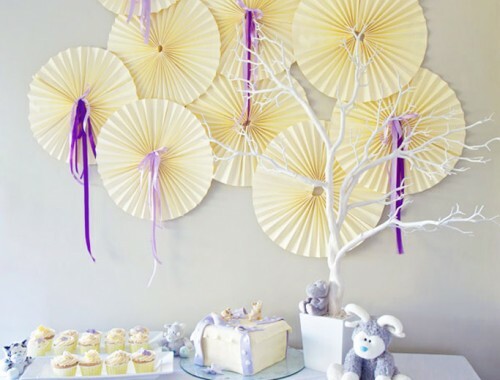 Not only do the treats looks delicious, your styling captures the essence of the season beautifully. Well done Ev! Beautifull and delicious!! Happy new year! Thank you so much Maite and a very happy new year to you too. Thank you for this recipe. I have tried it and it was lovely. I am a little confused by the reference to lemon juice in the instructions, but it is not listed in the ingredients. Regardless, this was a lovely recipe.